Tons of breweries have opened up in Little Rock in the past year, and one is right down the street from my sister's house. It is a tiny little place with really great beer and alternating food trucks in the parking lot. 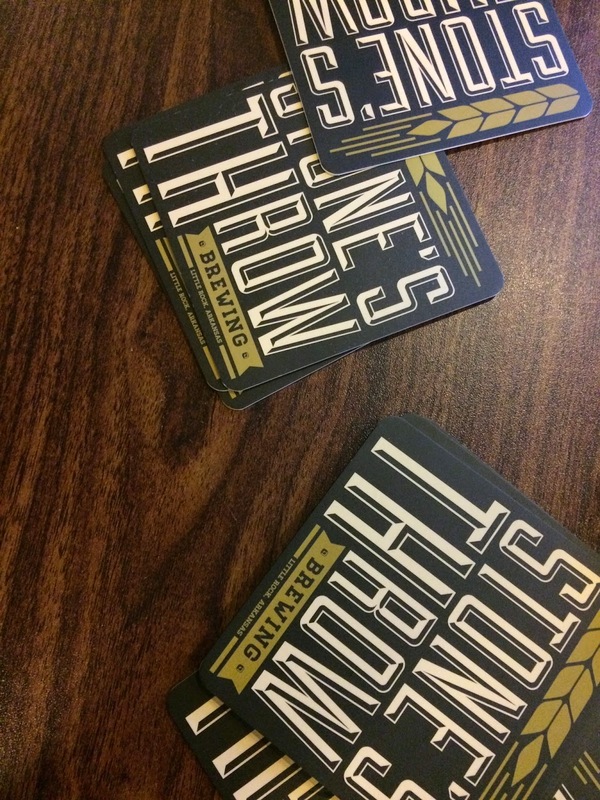 Stone's Throw Brewing has been opened in Little Rock for over a year, but I hadn't made my way there until a few weeks ago. Casey and I popped in after the SoMa Mardi Gras parade, and the place was packed. 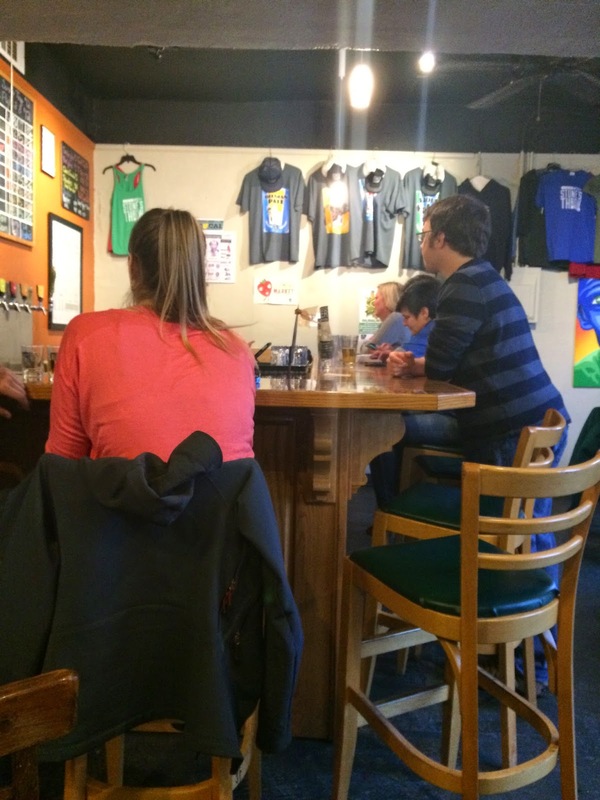 They have tons of beer on tap, so we had one poured and snagged a table back in the brewing area. On Sunday nights, Katmandu Momo is parked outside, so we decided to head down and have dinner with my sister and her beau. 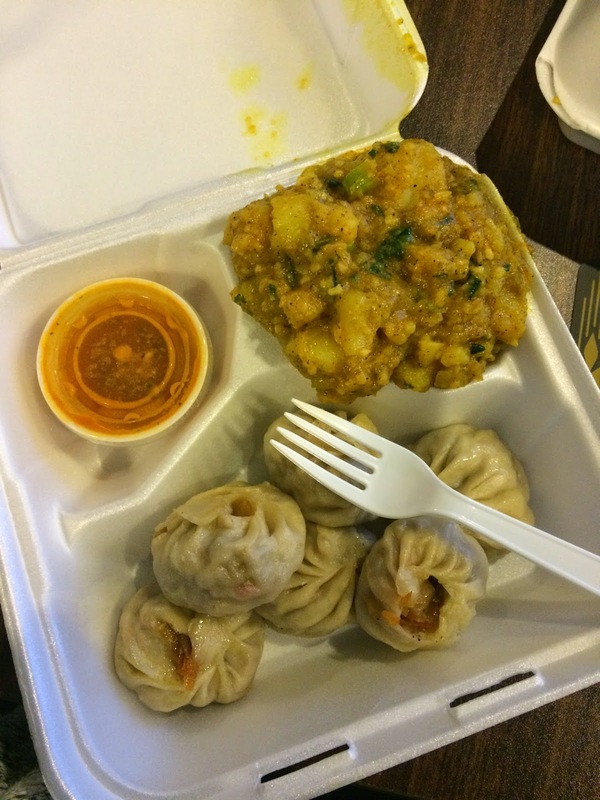 I wrote about Katmandu Momo before, which was my favorite meal of 2014. So, we headed downtown and snagged a table inside. It was cold and raining, but it was warm and inviting on the interior. There were groups of people enjoying beers and playing board games from their big collection in the corner. Stone's Throw does not have the polished look of so many new places in Little Rock, but I like that. 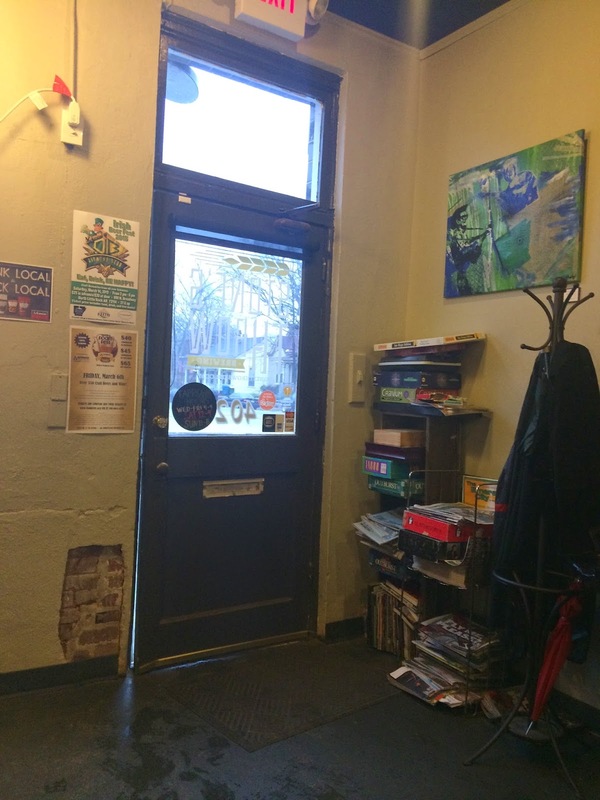 It definitely feels like a neighborhood bar, and if you walk there, which we did, you get $1 off your beer. Even though the place is small and can get kind of loud with all the patrons, we had a good time. We headed outside to order food from Katmandu Momo, and they brought it in to us when it was ready. 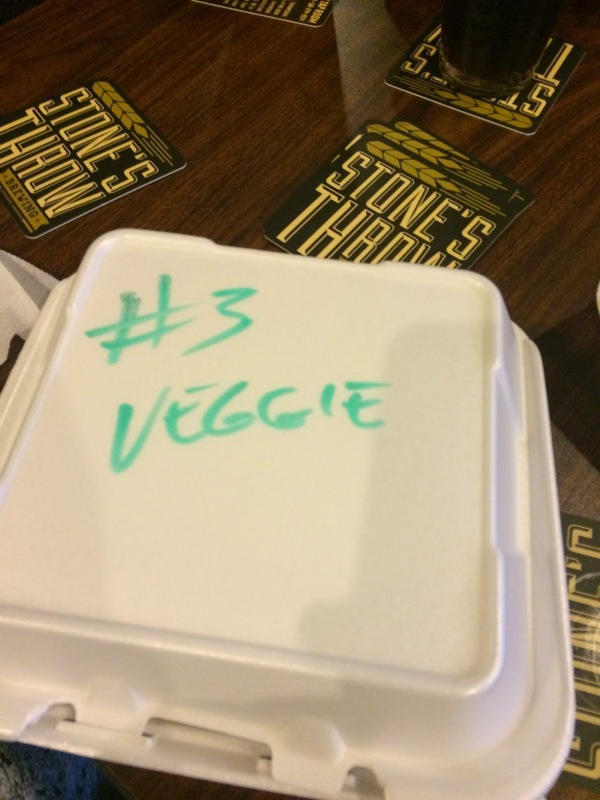 This was my second time having it, and Josh's first, so we ordered an array of stuff. I got the veggie momo and potato salad, and Josh got a mix of their chicken and pork momo, fried rice, and veggie spring rolls. We shared sides, so we could both get a taste of everything. 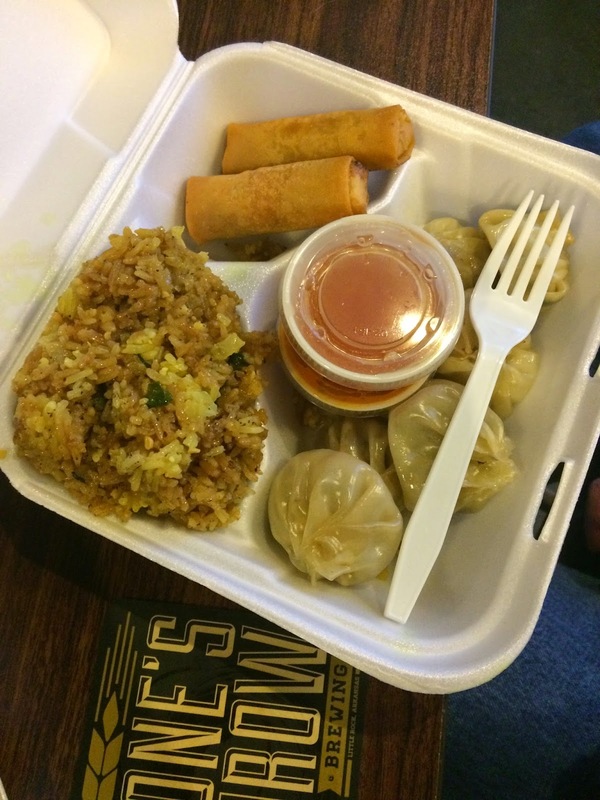 On my second go round, I was a little underwhelmed by the dumplings and potato salad. My momo were greasy, which I mentioned before, but this time it was a little too much. My potato salad was way too spicy, and I like spicy. Josh's fried rice was great, so I would order that again in the future instead of the potato salad. He liked his dumplings, but he wasn't wild about them. It may have been an off night, or the combination of beer and greasy dumplings might not have been what I needed at the time. Katmandu Momo dumplings are still very good, but they're not a light dinner. The beer was great, though! Sometimes with small breweries, the end result tastes too much like a home brew. That's not the case here. I had a heavy beer to start, the Lil Peaty, which was deeply woodsy and tasted of peat, like the name suggests. For my second beer, I went for the cream ale, which was lighter and a little sweet. I would like to go back and try all the flavors though. There is a new Brew Bus service in Little Rock, which will take you around to all the local breweries. I'm hoping that the next time we have a house guest, we can take them on a tour of our great local breweries. 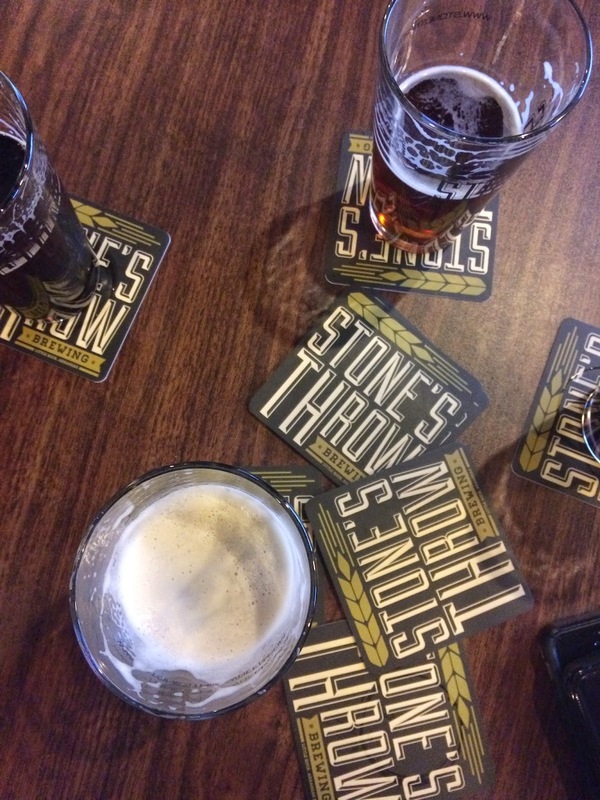 Stone's Throw was sampling beer during the marathon!! Next time I'm in town, I definitely wanna check out their place! Men's watches too have a huge range, you can set the mood by wearing a rugged fake rolex or something really classy for the corporate party, you can impress your girlfriend by wearing something expensive, stylish and novel or else you can also wear something smart but quiet so that all you can see in a watch is time. For adventure and sports loving people the replica rolex watches are available which are water proof and weather proof, you can use the watch wherever you go. You can even use the watch to make it match with the regular office wear, you will also get the satisfaction of wearing something new each day. The product range of watches available is huge today, from designer watches to regular watches you can choose and pick. Designer replica watches uk too are available at an affordable range, you can find these with huge discounts at online stores which deal specifically with the watches. The excuse is the watches are flexible, you can make a wrist watch to look formal as well as it will look stylish, a wrist watch can be used as a hublot replica, or style statements which will help you boast of your financial and social status. Watches are around for each occasion.